Novelist John Harvey brings his affable, jazz and sandwich-loving detective, Charlie Resnick, to the stage for the first time in this adaptation, part of the Sweet Vengeance season at the Playhouse. A murder mystery set in Nottingham 30 years after the Miners’ Strike, it exposes the resentment that still runs within the mining communities and which Resnick is forced to confront in himself. Darkness and shadow prevail. Giant black screens dominate the stage, opening to release terse spillages of action in a story with several, perhaps too many strands. Monochrome stills of the strike and X-rays and scans of the dead girl’s skull have silent impact. Cameo room settings, brief capsules of light, slide in and out with the precision of filing drawers, each in itself a clue to the inhabitants. Nottingham is Harvey’s home town, so the speech and dialogue have a rare and sustained authenticity. David Fleeshman captures in nice detail the Resnick of the novels, a shambling, deceptively mild figure who absorbs more than he lets on and whose private torments can surface with sudden force. Simone Saunders is the perfect foil as his impatient, physical colleague, Catherine, and Elizabeth Twells plays the murder victim and union activist, Jenny Hardwick, with raw passion. A fugitive in a parka, she embodies all the bitterness and fierceness of the conflict. 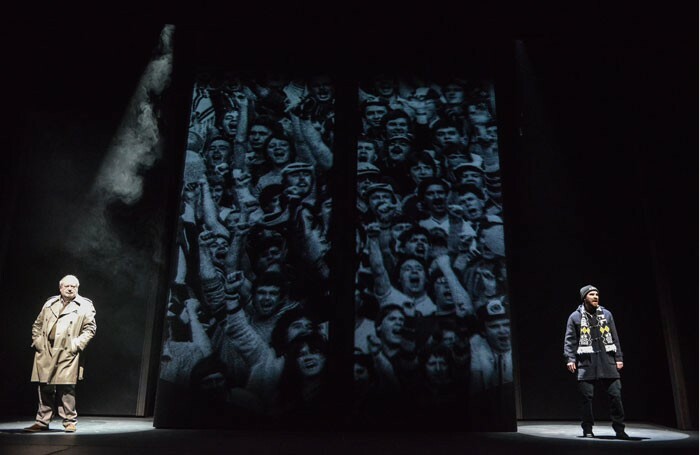 The story is fictional but the production comes in advance of an inquiry into the policing of the strike – the political context is as pertinent as ever.